Bring order to the chaos in your home with tips from professional organizers on decluttering, forming habits and teaching kids to follow suit. Do you live in clutter or cleanliness? Are your kids rooms organized or disaster zones? As spring kicks off, it’s a perfect time to dive into all the closets, drawers, boxes and bins in every room of the house. And cleaning isn’t just for cleaning’s sake — it’s actually beneficial to your health to go home to an organized space. About Space, which is based out of Maumelle, is a professional organizing and personal concierge service. And while it’s Ludvinsky’s job, she knows it’s not realistic to be 100 percent clean all the time — but she does love an organized space. “I brings me joy to make things clean and uncluttered and serene,” she says. Similarly, KonMari certified consultant Sue Fehlberg, who runs decluttering and organizing business Tidy Nest, sees the happiness that an organized space can bring. “I think people are so overwhelmed by their lives and how busy they are … So to be able to come home to a place that’s peaceful where they can relax and rest, I think that’s what people are looking for now,” says Fehlberg. Fehlberg practices Marie Kondo’s methods, which became increasingly popular after the debut of Kondo’s Netflix series, “Tidying Up with Marie Kondo,” at the start of the year. Though different organizers like Fehlberg and Ludvinsky utilize different methods, they share a common goal: to help people feel in control and eliminate the clutter from their lives. While that task may seem overwhelming, there are steps anyone can take to get organized and then stay organized. Here are some of their advice on teaching kids good habits, figuring out what to get rid of and more. Lyndsey Sullivan, Eva, 17 weeks, and Jonah, 4. Lyndsey, who manages her own photography business, uses both Google Calendar and a paper calendar (which even includes grocery lists and meal plans) to keep her worlds organized. She also utilizes Google Tasks Manager for work, which allows her and her employees to see each other's lists, add to them and help cross things off. Ludvinsky uses these concepts throughout each home she organizes. They’re simple ideas, but when followed, it’s easy to figure out how to put things away and maintain the organization. Ludvinsky says a simple illustration of this is a silverware drawer: forks with forks, knives with knives and so on. It’s much easier to find things when they’re stored together. For example, keep all your scissors in one spot instead of scattered in drawers and bins in different rooms. Everything needs a place to belong. For example, if you have a designated bin for your kids’ sporting gear, you’re much more likely to put it away rather than letting it pile up on the laundry room floor. It’s as simple as it gets, but as Ludvinsky says “Once you add one piece of clutter, it gives birth to more clutter and more clutter and the clutter will multiply!” Don’t delay in putting things away and you’ll stay on top of the mess before it can even begin. Fehlberg follows Marie Kondo’s six rules for decluttering and organizing. Even if you’re not on board with Kondo’s entire process, anyone can take bits and pieces and use these as guidelines for getting neat and tidy. • Commit yourself to tidying up. • Imagine your ideal lifestyle. • Tidy by category, not by location/room. • Follow the right order: clothing, books, papers, miscellaneous and then sentimental items. • Ask yourself if it sparks joy. Begin by going through and picking up every single item and deciding if it “sparks joy.” Fehlberg says it’s important to gather items from across the house into one spot. So, for example, when starting with clothes, take everything from under-the-bed storage, dresser drawers, closets, etc. and combine it. “You start from a place of abundance so you see that ‘oh, I have plenty of things. I don’t have to worry about getting rid of too much,’” Fehlberg said. After you’ve narrowed down your items to only things that spark joy, it’s time to store them in a way that makes the easy to access and see. 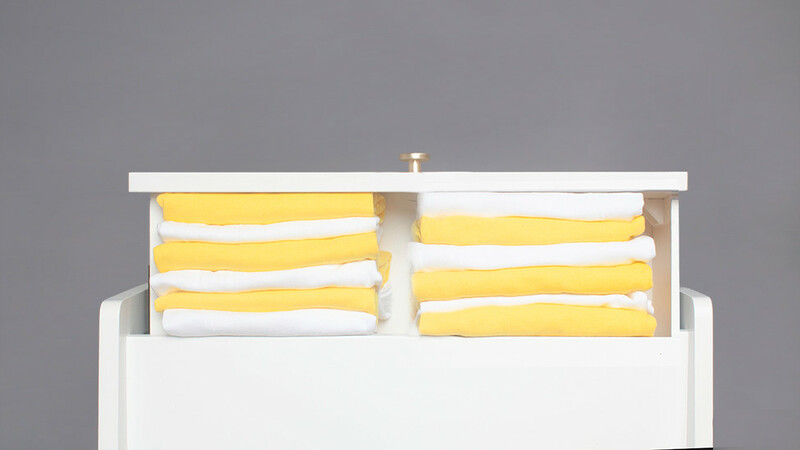 With clothing, it’s essential to organize drawers in a way that keeps everything visible. Want to learn more about how to clean KonMari style? Fehlberg is teaching a free workshop at 1 p.m. on April 6 at William Laman Public Library in North Little Rock. She’ll demonstrate folding techniques, share organization tips and answer questions. Label toy bins with photos or clip art rather than words so that kids actually know what goes where! Using bins without lids is also easier for little hands that don’t need the extra step of taking off a lid (and then putting it back on). There’s a rack at the door where her kids know shoes should be placed and now it’s just part of the coming home routine. Any parent can help their kids create clean habits, whether it’s putting dishes in the dishwasher immediately after eating or closing drawers in the bathroom after getting ready in the morning. Keep the categories basic. In the toy room, for example, stick to “stuffed animals” as the category for a bin rather than separating into “teddy bears” and “Beanie Babies.” The easier it is, the more likely kids are to follow through on cleanup. Artkive is an app that allows you to photograph artwork, cards, certificates, etc. and save those images digitally rather than holding on to every physical keepsake. The app also allows you to print a hardcover book of all of those images once you have a collection compiled. “If they’re not framers, they probably don’t belong in your house,” Ludvinsky said. She restricts sentimental items to only keeping pieces that fit in one box about a cubic foot in size for each member of the family. It can be hard to say “no” to new things coming into your kids lives — and toy bins and closets. That’s why the Ludvinsky family practices a “Santa takeback” each Christmas. She has also had honest conversations with grandparents and friends about not gifting “stuff” to her kids but rather experiences, which helps cut down on clutter. In order to teach kids to stay clean and organized, parents need to model that behavior themselves. By involving kids in the decluttering, cleaning, and organizing processes, they’re much more likely to help maintain that level of tidiness. Fehlberg said she recently worked with a 3 year old to go through her things and decide what to keep and what to donate. She recommends saving toys for last, since kids generally have more of an emotional attachment to those than to other items. However, she says that you’ll be surprised how many opinions your kids have about their things. However, Ludvinsky warned against letting kids have too much control. Asking questions to help them decide what they truly want to keep and what can go is helpful, in her opinion. For more information on Megan Ludvinsky’s company, visit AboutSpaceOrganizing.com. For more information on Sue Fehlberg’s company, visit TidyNest.net.